This is not a review. I was not asked to write this post, nor was compensated for it. 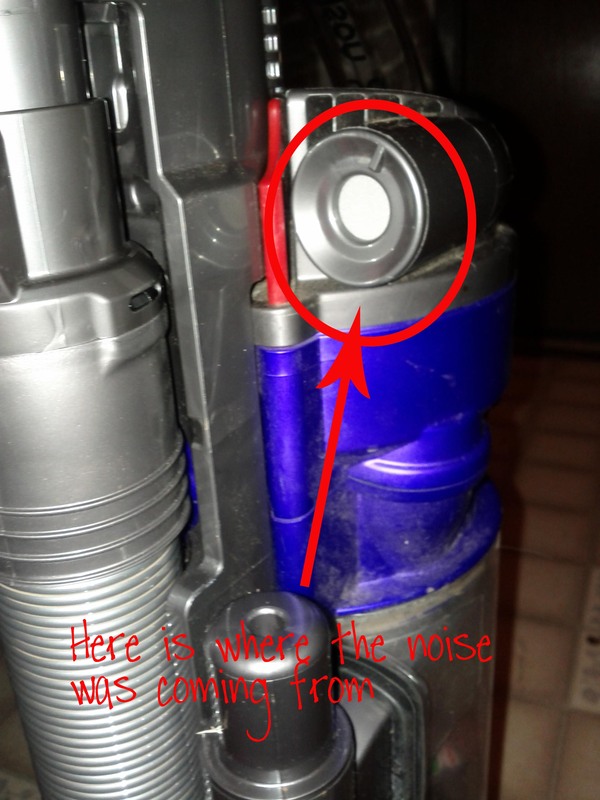 I have no affiliations with the Dyson company. I am just a mom sharing her experience about her vacuum. When the Dyson company started selling their vacuums I coveted one. At the time they only had the one model, which you could also get in the ‘animal’ version. I was finally given one as a gift after Baby Sid was born. I would have chosen a different model, for only one reason. The handheld hose part. I have the DC24 Animal, because we are dog people. We don’t have a large house, so this vacuum is great for us. It is compact and light weight. Because of the dog, I do have to empty the canister before I am done vacuuming the living room, but that is not a big deal. My only complaint is that when I want to use the hose I have to take it apart first. See. I can’t just pull up the hose and vacuum the cobwebs in the upper corner. I have to take it apart and put it back together. This is the only design flaw I have found. If I had known about it, I might have looked into exchanging it. However none of that has anything to do with what made me fall in love with my vacuum company. While vacuuming one day it starting to make a bad noise. I noticed that the noise was coming from this white disk. It still worked, yep no loss of suction. It just didn’t work as well as before. When I covered the circle the sound went away, but then it would come back. I looked on their support page for help, but couldn’t find an answer. The support page offers contact information so I decided to write an email as I wanted to send them the above picture explaining what was wrong. I sent them an email at 11:15 a.m. They replied at 11:21. The same day. Yep. They responded within SIX minutes. And it wasn’t one of those, ‘we got your email and we will get back to you’ responses. They answered my question. And while I know it was a canned response, it was tailored to my problem. That means someone read my issue and adapted the response to me. I can’t tell you how impressed I was at the quick response. Turns out my vacuum was clogged, but not in a place I could easily see. The email explained how to remove the clog. I vacuumed up the stuff that was clogging my vacuum and it filled the canister. Twice. Not only was I impressed with the fact that my vacuumed still worked while clogged, the very quick, very helpful customer service is what really wooed me. Would I recommend spending that much on a vacuum? Yes, yes I would. Since I had a few people contact me about Dyson’s response I thought I would let you know what they said. Look for and remove any blockages from the cleaner head or lower duct hose. Recline the handle of the machine and place handle on the floor. Locate opening for C-clip on the front of the. Place flathead screw driver into the opening and lift C-clip straight up to unlock cleanerhead from machine. Remove cleanerhead from the machine. Once the cleanerhead is removed inspect the pins on the cleanerhead and the outlet on the main body of the machine for damage or debris. Categories: Cleaning, Homemaking, Motherhood | Tags: Cleaning, Dyson, Dyson DC24, Dyson Sounds, Dyson Trouble Shooting, Family, Vacuum, Vacuum cleaner, weird sound from dyson | Permalink. Hi there, I have this same exact problem with my vacuum. Where was the clog and how did you fix it? Thanks! Thanks so much! That was totally nasty! SO MUCH HAIR. I can’t test it out just yet, as I washed the filter and am waiting for it to dry, but I will let you know. Thanks! Our dyson is making the same noise yours was where was th clog and how did u get it removed thank you! Thank you so much, we had the same problem and it worked perfectly!!! I didn’t know how to explain the problem, so when I googled it, I switched to view image results, and I saw the photo of your vacuum. Thank you for posting! I am so glad this helped you! Terri, I am sorry they do not make sense to you. I copied the email that Dyson sent me as others wanted to know what they said. I was able to follow the instructions and find the blockage in my machine. I hope you find the solution to your vacuum issues. The ‘C-clip’ is just what is sounds like. A plastic part in the shape of a C that holds the cleanerhead to the vacuum. The cleanerhead is the part with the brush in it. I googled the parts as i went through the instructions and learned all sorts of parts to my vacuum. Thanks again. This post was magic and saved us from buying a new vacuum cleaner! Well done for sharing and thank you. Ps, it was the dreaded pine needles….